June 15 in Annecy, in the content market of MIFA, which annually takes place during the most prestigious animation festival in the world (Annecy International Animated Film Festival), the European premiere of the first teaser of the animated film 'Mavka. The Forest song’ happened. The presentation took place at the National Ukrainian stand, gathered representatives of the world's largest studios, investors, buyers, and distributors and became one of the brightest events of the market. 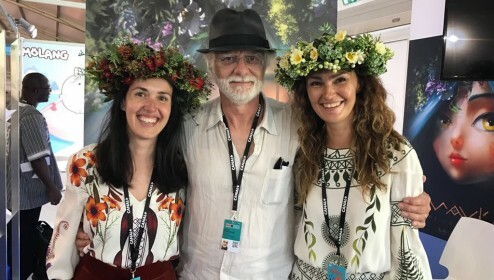 The guests of the premiere in Annecy were the first to meet the main character of the animation film Mavka - the soul and the keeper of the Forest, as well as her friend - a funny Swampy. In addition, the teaser presents one of the main locations of the film - the glade where the magical willow grows. The strength and magic of the key moment in the story – Mavka is meeting her love - is easier to feel because of the enchanting melody of Lukash "sopilka" (reed pipe). This musical theme, which will become one of the main themes in the soundtrack of the future film, was written and performed by famous Ukrainian musicians from the DakhaBrakha band and multi-instrumentalist Maxim Berezhnyak. «I was very impressed by the delicate work you did on this trailer for Mavka. The light and the textures (together with the color pallet) are very subtle and serve totally the ambition and the direction of the film»- shared the impressions one of the guests of the presentation, Corinne Cooper, Executive Producer of TeamTO - the third largest animation company in France (among the projects of the company animated series for Disney Television Animation -"Sofia the first" And "Elena, the Princess of Avalor"). The surprise was set for guests: the producers personally wove wreaths and gifted them to guests to make them feel as a part of the magical world of the animation film. Those who wanted to try on Mavka style were so many that Iryna Kostyuk only had to make more than thirty unique ornaments that evening, which then could be seen throughout the city that evening. Guests wanted to look not only like the main character of the project but like the film's team: Iryna Kostyuk and Anna Eliseeva were in wreaths by Patoka and wore dresses based on the animation film by designer Olga Navrotska. Recall that it was she who became the costume designer for the film and it is she who owns the idea of the dress, in which Mavka appears in the teaser. Also, the visitors were delighted by the temporary "Mavka’s Tattoos" using the Augmented Reality technology, which was previously presented at the ‘Cartoon 360’ in Barcelona, and their ornament was also used in the teaser. The day after the presentation, Irina Kostyuk presented the project ‘Mavka. The Forest Song’ during the roundtable "Engaged & Emerging Filmmakers" as a part of the first international conference WOMEN IN ANIMATION WORLD SUMMIT sponsored by Walt Disney Studios. Iryna's co-speakers became her colleagues from all over the world who work on animation projects in a wide variety of genres, and moderator of the discussion was Bonnie Arnold, president of Dream Works Animation, nominee for the Oscar. She can be called, without exaggeration, the legend of the world's animation: for 33 years she held executive positions in Columbia Pictures, Walt Disney Feature Animation, Pixar and Dream Work’s Animation, and also produced such projects as "Family Addams", "Toy Story", "Tarzan", " How to Train Your Dragon "and other cult projects of world cinema and animation. At the summit Irina talked about the common position of Animagrad, honest and tolerant in gender and age issues, and about the features of work on the animation film ‘Mavka. The Forest Song’, where many women professionals are involved: project producers Iryna Kostyuk and Anna Eliseeva, director Sasha Ruban, costume designer Olga Navrotska work with dedication on a modern interpretation of Lesya Ukrainka and present to the world her unique female character Mavka. Bonnie showed her admiration for the project with a film and wished the creators luck, and noted that authenticity and a strong female character is a hot trend in the world of animation. Thus, the trip to Annecy became a new step in the promotion of the project in the world market. Among potential partners of Mavka, are Germany, France, Belgium and the Czech Republic. One of the important results of the trip to Annecy was the expansion of the circle of partners interested in co-production of the film to the east: the producers received proposals from the representatives of India, and the interest from the multi-million, in all aspects, China to the project is extremely high and promising. It is worth noting a significant interest in the project of global sales agents, although the pre-sale phase is not yet open. The national premiere of a teaser of an animated film will take place as a part the Odessa International Film Festival, this summer. Media Resources Management is the company responsible for submitting ‘Mavka. The Forest Song’ to these and other events. FYI: Mavka: The Forest Song is a full-length animated feature produced by Ukraine-based Animagrad (FILM.UA Group). It is currently at the concept stage of development. The film is inspired by a play of the same name by Lesya Ukrainka, as well as by various Ukrainian legends and cultural traditions. The film’s production crew includes experts from leading ethnography institutes: the Ukrainian Studies Center at the Taras Shevchenko National University of Kyiv, the Ivan Honchar Museum, and the Ukrainian Fashion Museum. The experts are there to ensure the authenticity of the Ukrainian myths and legends, religious beliefs, rituals, and visual culture translated into the singular animated world of Mavka. And the world-renowned group DakhaBrakha has already committed to creating the film’s soundtrack. In September 2016, the animated feature Mavka: The Forest Song won the ninth contest held by the Ukrainian State Film Agency and was awarded state financing in the amount of 30% of the film’s total budget. 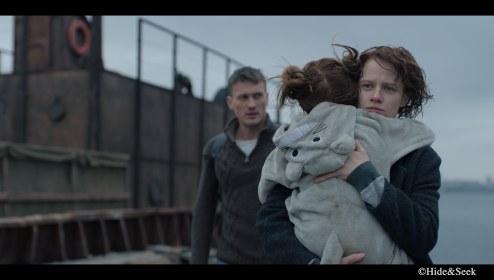 Mavka: The Forest Song is scheduled for release in Ukraine in 2019.